This old fashioned chocolate pie recipe is super rich and creamy with a dark, fudgy flavor. You can use a pastry crust or an easy crumb crust for a no bake pie that’s just like grandma’s! You will literally never want to use a boxed pudding mix once you try this – it’s just SO good! Updated from the June 2008 version to improve reader experience. Just like Grandma used to make! 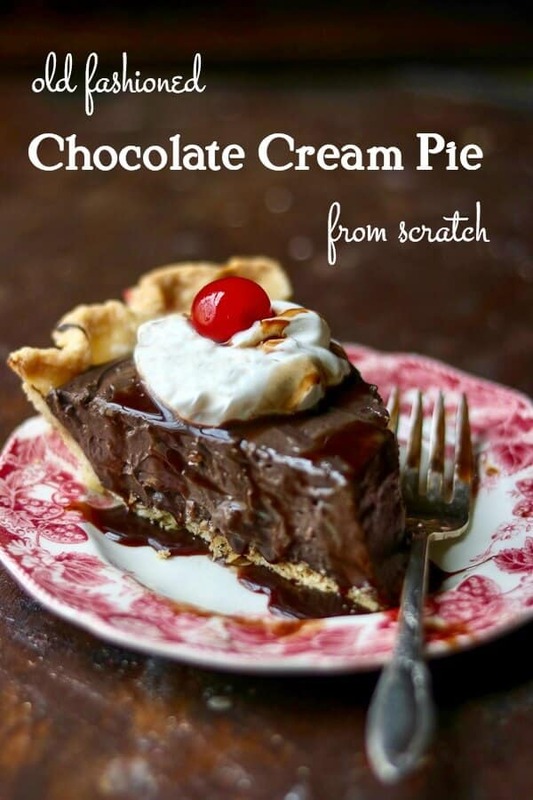 This easy chocolate pie recipe will be a family favorite! I think I inherited a passion for chocolate from my dad. He was a chocolate freak. His favorite besides chocolate cake was Hershey’s with Almonds. Oddly, he disliked chocolate ice cream and chocolate pudding. Go figure! He was such a chocolate fan that when we lived in Pennsylvania he used to buy cocoa hulls (that came from Hershey, I think) to use as mulch in his garden. The entire yard smelled like Willy Wonka’s place. I don’t know if you can still do that but if you can…you should! It is amazing. This pie is one of my favorites. Creamy and rich, chocolate pie just is the best make ahead dessert for summer, ever. The filling can be made with heavy cream, half and half, or whole milk if you don’t want to use evaporated milk. It can even be made with a combination of them but do not make it with skim milk. You will lose the texture completely. I think that the evaporated milk works the best and results in the creamiest, chocolatiest texture so please try that at least once. Try putting that luscious filling in this Oreo cookie crust for an easy, no bake dessert! There is nothing creamier than a homemade chocolate pie! Here are some frequently asked questions about making chocolate cream pie. This recipe is suitable for beginning cooks. How do you make a chocolate pie? Here’s a rundown of the instructions – they’re pretty easy! Whisk the milk and sugar together until smooth. Mix the flour, salt, and cocoa and then carefully whisk into the milk mixture. Add some of the hot mixture to the egg yolks and then quickly stir the egg yolks into the pudding mixture. Heat for approximately one more minute. Mixture will coat the back of a cold spoon. Stir until melted and add the vanilla. Mix all of the ingredients together except the egg yolks, butter, and vanilla. Microwave on 100% for 3 minutes. Microwave on 50% until the mixture thickens. Whisk some of the hot mixture into the egg yolks then whisk the egg yolks back into the pudding. Microwave on 50% for 2 minutes. Stir in the vanilla and butter. Why is my chocolate pie runny? You didn’t use enough flour/cornstarch. You used cornstarch and cooked it too long so the cornstarch broke down. You didn’t cook it long enough. You didn’t chill it long enough. When your pie filling is done you’ll be able to stick a spoon in it and it will cling to the spoon. If you run your finger down the back fo the spoon it will leave a clean “trail”. Can you freeze a homemade chocolate pie? Nope. I don’t recommend freezing a homemade chocolate pie. The filling is likely to separate and get watery. Do you need to refrigerate chocolate cream pie? Yes. Always keep it tightly covered in the refrigerator before serving. Store leftovers covered in the refrigerator as well. How long before I can put a pie in the fridge? After you’ve filled the pie crust let the pie cool on the counter for about 30 minutes and then refrigerate promptly.Don’t keep a cream pie out of the refrigerator for longer than 2 hours. How long to store a chocolate cream pie? You can store a chocolate cream pie – or any cream pie for that matter- in the refrigerator, tightly covered, for about 2 to 3 days. Millionaire Pie – so rich and creamy! You’ll love this easy, no bake summer pie! 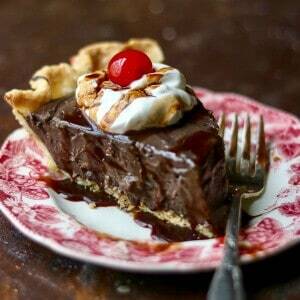 Chocolate Chess Pie – this is a southern classic. Kind of like a custard pie, kind of like brownie batter, kind of like nothing you’ve ever tasted! 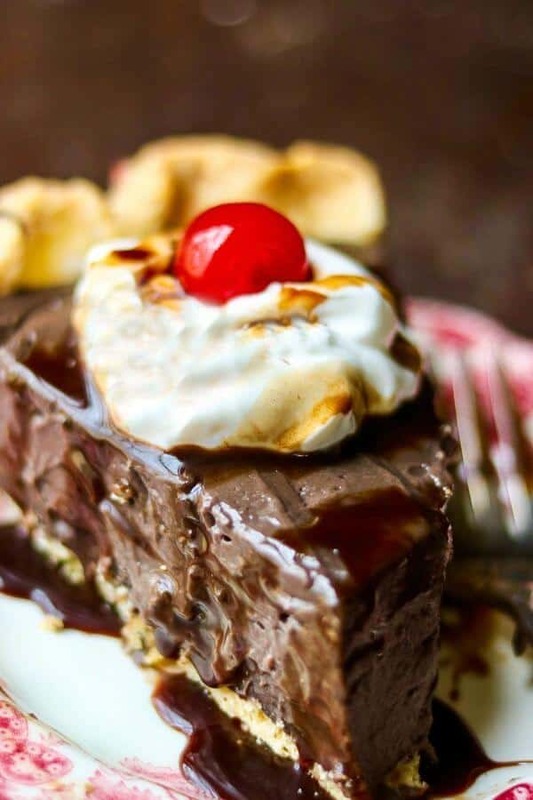 Chocolate French Silk Pie – melts in your mouth! This is a classic, y’all! Dutch Apple – ok, I know it’s not a cream pie but y’all. It’s SO good. That crumble, though! Coconut Pie – I found this in an old, and I mean OLD cookbook. I’ve never had anything like it before. It’s kind of like pecan pie but with coconut! Peanut Butter Pie with Pretzel Crust – this is for all you fans of salty-sweet combinations. 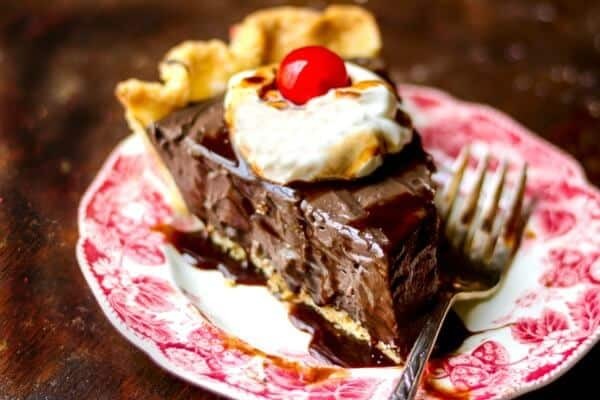 Texas Flood Pie – ok this chocolate masterpiece is my take on a Mississippi Mud Pie – and you know how competitive we Texans can get! Lemon Ice Box Pie – the real deal! This is the old fashioned recipe that you remember made with Eagle Brand just like Grandmas! Homemade chocolate cream pie is a favorite for most people. This whips up quick and easy so it’s perfect for potlucks and summer picnics. The dark cocoa makes it the best, most chocolatey chocolate cream pie you’ve ever had, I promise! Top it with whipped cream or serve it next to some ice cream – it’s bound to be a hit! Whisk milk and sugar until smooth. Cook, stirring constantly until mixture thickens. Heat for approximately one more minute. Mixture will be quite thick. See more Meal Plan Monday ideas! Best chocolate pie ever! This is a keeper. Everybody at my Christmas dinner loved it. Thanks!